What exactly is tetrazzini? It's a pasta dish with mushrooms and cream sauce. We added black pepper, nutmeg and green onions to our easy chicken version. 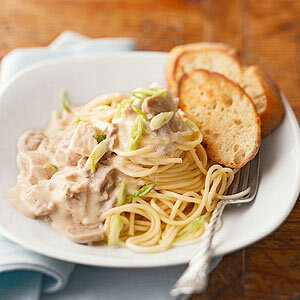 In a 3-1/2- or 4-quart slow cooker, combine chicken and mushrooms. In a medium bowl, stir together alfredo sauce, broth, sherry (if desired), pepper, and nutmeg. Pour over chicken mixture in cooker. Meanwhile, cook spaghetti according to package directions; drain. Stir Parmesan cheese into chicken mixture in cooker. Serve chicken mixture over spaghetti, topping each serving with green onion. If desired, serve with toasted French bread slices. Makes 8 servings.